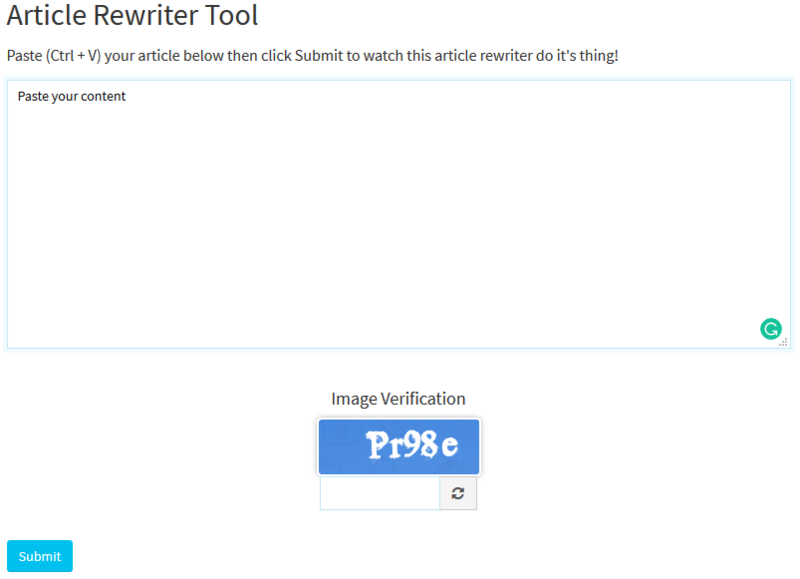 What is Article Rewriter Tool means? Article rewriter tool is an amazing tool to rewrite the duplicate content into pieces of unique content. It is used to rewrite competitors content or your own article content and make the article unique enough to pass plagiarism. An article rewriter tool replaces all the important unique words with synonyms to make the site content unique. Article rewriting is done with the tool, who needs fresh and original content immediately without creating from scratch. So there are many many tools and software which provides unique content, but some article spinning may require a purchase and has some restrictions for the user. The article which is spinned will not have complete readability sentences and requires some manually written words for overall unique structure. Regenerating fresh ideas and unique content is the key strategy of this tool to help people generate fresh contents. How Effective is Article Rewriter Tool? When a content writer or a webmaster wants to write content manually, definitely it takes a lot of time to get the flow of content and makes him very tired. So many people choose article rewriter tool to reduce their time and generate unique content. Because our tool is very fast and efficient so that you can generate 50+ articles a day with help of this tool at the same time. The article rewriter tool gives you a plagiarism free content except for readability and few alternate phrase words. So the unreadable words need to be modified manually by the content writer or the webmaster into friendly readable content. While modifying the content phrases, the tool provides a vast number of synonyms which helps the content writer to match along with the content. The search engine needs unique content to analyze and rank your keywords. If a blogger/content writer works on writing unique content on any product or services blog regularly, search engines spiders crawl and index regularly. Because it attracts lots of visitors to the site, initially it takes a lot of time to write unique content and grows up along with you. Keep writing articles consistently and stick along with it. The content writer always writes fresh content for promoting, so there is a need for fresh content to improve organic search results. Solutions like article rewriter tool can replace them without any cost of developing new content. Just use any existing article and spin the article with the tool, generating unique quality content is the ultimate goal for publishing without any readability issues. Using article rewriter tool is not a big issue, but the main problem is to make readable and understandable for the visitors. Once the article is spinned with the tool, it is time to recheck manually once before going live on site. The tool has both advantages and disadvantages to get fresh content, but its recommended to use the tool safely without any irrelevant words. What does Article Rewriter Tool do? Article rewriter helps to rewrite your duplicate content into fresher original content. Just copy a required piece of content and paste into the box and watch the magic of the article rewriter. Article rewriter is the greatest and a fantastic tool to rewrite duplicate content into fresh content without much writing effort. All the tool will do the work automatically in the background, content is the magical formula for Search Engine Optimization attracting more visitors to the site. With our free article rewriter tool, you can generate fresh content instantly and improve your website quality. Writing a small content takes the time or hiring a new content writer to write fresh content takes more investment. So we provided a free tool generate quality content for promoting your website. The tool first scans through your content and identifies the specific words to be written with synonyms. So the words will be replaced with synonyms by the article rewriter tool. Just verify the rewritten content by replacing with correct synonyms. The aim of the article rewriter tool is to produce quality content by improving with new words or phrases. Some words may be difficult to read, so the content writer should be responsible for checking the content readability before going to live on site. After copy-pasting the content as explained above, now type the captcha code as shown in the text box. Captcha code is used to verify either the user or robot making use of the tool. Because many developers create a script in which the script run in the background and crawls the required site to extract data or execute the operation. Finally, click the submit button, you can see the article is spinning by rephrasing the words to make content unique. It takes quite a bit of time to rewrite, once done you will have fresh content to be used for marketing promotion. If you are not happy with the content you got, you can rewrite once more time without any restriction. Just click on rewrite again button on that time, you will see a new content produced with alternate synonyms. You can check plagiarism either the content is unique or not for online marketing promotion. If it is not unique, just manually rewrite certain words and publish your content. How can article rewriter tool be helpful in content marketing? It can help you save time to generate new content without working hard. Just copy and paste the required article in the textbox and click submit button, you can generate fresh content again and again with this tool at no cost. The tool automatically generates fresh content by adding new phrases of synonyms into existing content and make uniqueness. Suppose if you want to write meta tags for a page, the meta tag should be unique among the competitors. By taking small pieces of content from the competitors and rewrite your meta ad copy with the help of article rewriter tool. The tool replaces the existing words with new synonyms to make meta tags SEO friendly. To promote and improve organic traffic, content is the key for all areas of online marketing. If the content is duplicate and low quality it doesn't add value to the visitor or search engines. Sites like guest blogging, article submission sites, web 2.0 sites, Q&A sites, forums, video marketing sites requires huge content for promoting online. But with the help of this tool, you can easily rewrite contents on various platforms and build successful backlinks. Many Microbloggers, social media owners use this tool for a quick, reliable, and easy way to rephrase the content for commercial purposes. It is helpful in social bookmarking, microblogging sites, social media sites and much more to share your content. Students require content for their academics projects. But writing fresh content requires a lot of time for the students, so the tool like this will help generate unique content and makes difficult to identify plagiarism. The generated content may not be much readable, the student's must check each and every line before updating on the project. The tool can be used to generate unique content for privacy page, disclaimer page, about us and terms & conditions. The owner or webmaster can take any content and spin the content with the tool, it gives fresh and unique content within a matter of minutes. Suppose if the webmaster finds any content is duplicate on the page, search engine algorithm penalizes the site and the website loses lots of visitors. To solve this problem, the article rewriter tool will spin the duplicate content and creates fresh content to be updated on the existing article to improve organic search results. Generating fresh contents faster and promoting will improve your site branding and builds reputation score. Review your content before going to the real world, because content may have spelling mistakes, grammatically unreadable and content structure. 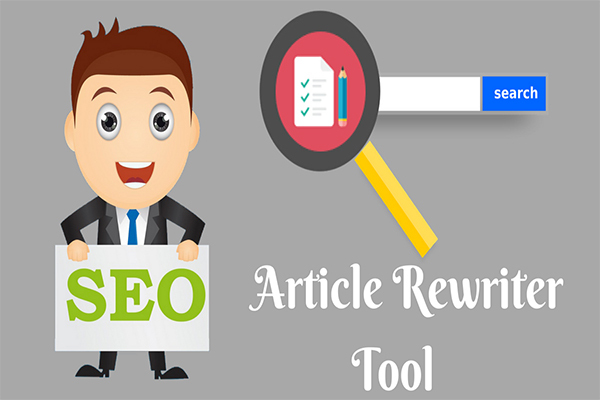 By using article rewriter tool, it helps us to reduce the cost to create fresh contents and make use of same rewritten content will improve organic traffic and backlinks. 1) Double your Content with original content - If you want the same article to be published more than once with a different version, utilize the quality original article at the beginning of the stage. Just paste the original content in the box and click submit button, the original article is rewritten automatically. With the help of article rewrite tool, you can use as many versions of the content you want, make sure the article was rewritten is human readable before finalizing the content. 2) Check for Readable Words - Once the article was rewritten with the help of article rewriter tool, few words may not be human readable. Because the tool may not generate right synonyms for the particular words in the content. So in this case, better find right words manually by rewriting the content or take help of a content writing specialist to make content readable and understandable. 3) Check for Plagiarism of Rewritten Content - We recommend the site owner to verify the content with plagiarism, it is required to check the content is uniqueness or not before going live on the website. So unique high-quality content is the key to overall success of your website ranking and traffic. Note: Making more and more versions of the same content may go worse and not be human readable. This also blacklists your site due to spun content.